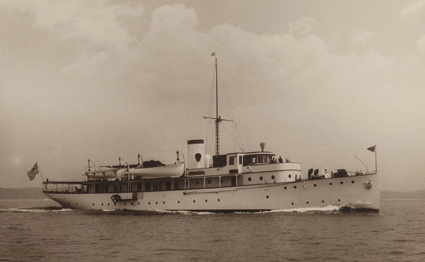 A 90-year-old superyacht could be spared an undignified demise after attracting the attention of restoration experts GL Watson. Caritas (pictured above) was due to be scrapped when she was found in a Californian trailer park, which has recently been sold. However, the Liverpool-based design and refit studio has launched an appeal to find a new owner willing to take on this mammoth restoration project. One of only a handful of pre-war superyachts still in existence, Caritas is a 156ft (47m) long vessel that was commissioned in 1925 for sugar magnate Joseph Percy Bartram. Built by Krupp Germaniawerft and designed by Cox & Stevens, she is described by GL Watson as “a fine example of 1920s design”. In her heyday, she was capable of a top speed of 12 knots, thanks to a pair of 640hp Union L-8 diesel engines. After being pressed into naval service during World War II, Caritas was renamed USS Garnet in 1942. The US Navy fitted her with six machine guns, although it is unlikely they were ever used, as she was stationed in Hawaii and used as a messenger ship. In the postwar years, Caritas fell into a sorry state, and ended up being converted into a gift shop and visitor attraction at Californian trailer park Ship Ashore. But GL Watson believes that with the patience and wealth of the right owner, Caritas could be restored to her original state once again. A spokesperson for the company said: “Caritas is the last opportunity to save and restore a significant high pedigree interwar yacht. The interior pipework and wiring has been completely stripped out, GL Watson adds, but there are no signs that any welding repairs have taken place. Despite spending more than 50 years out of the water, her previous owner claims that “her hull is still sound as the day upon which she was launched”. The 490-tonne vessel has enough interior volume to create 10 superyacht-sized cabins, and while the original timber decks and some interior mahogany panelling is still in place, an entire engine refit would be needed before she can be relaunched. 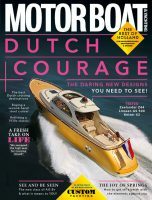 The layout also includes an upper-level Shade Deck, that could be used to store a motor launch or a RIB. Should Caritas find a generous benefactor, she would join her restored stablemates Dona Amelia ( formerly known as Haida) and Talitha G (formerly known as Reveller).